At ixöq, we pride ourselves on selling high quality well-made products for you and your home. Our products are fun, whimsical, colorful, ethically made and useful all while honoring the customs and traditions of the communities of Lake Atitlán, Guatemala. We work with the artisans on the designs but also often give them artistic license to create using the patterns, colors and designs of their choosing. This is why we sometimes have items that are the same but not quite exactly the same. And we love this about our inventory! There are many one of a kind items but everything is made with the same high quality care that is important to us. We try our hardest to keep all of the photos updated with the exact inventory that we have at the time. Some of our products are made from an upcycled material called jaspe ("haspeh"), a traditional textile that is woven on a peddle-loom. The fabric includes intricate patterns of different colors centered around a primary color and design. The results are a variety of unique combinations and patterns. To make shopping for jaspe products a little easier, ixöq's jaspe products are divided into 4 primary color classes: brown; blue; turquoise/green; and pink/orange. And for those fabrics that are full of many exciting colors we've added a multi-color class. Below are some samples of different combinations that you may receive when ordering a specific color. Each are quite beautiful and the variety always makes for a pleasant surprise. 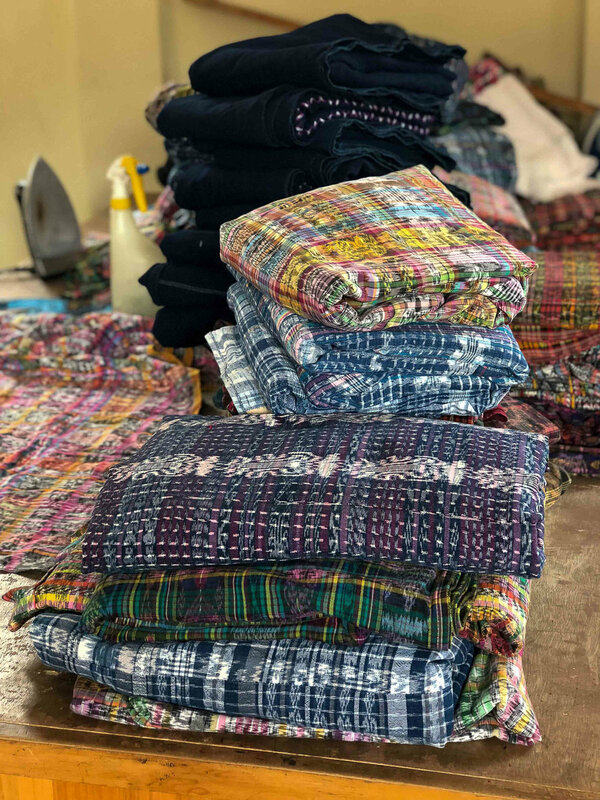 Many of our products are handwoven on several different types of looms, including back strap and peddle looms, and are made from natural fibers and dyes. 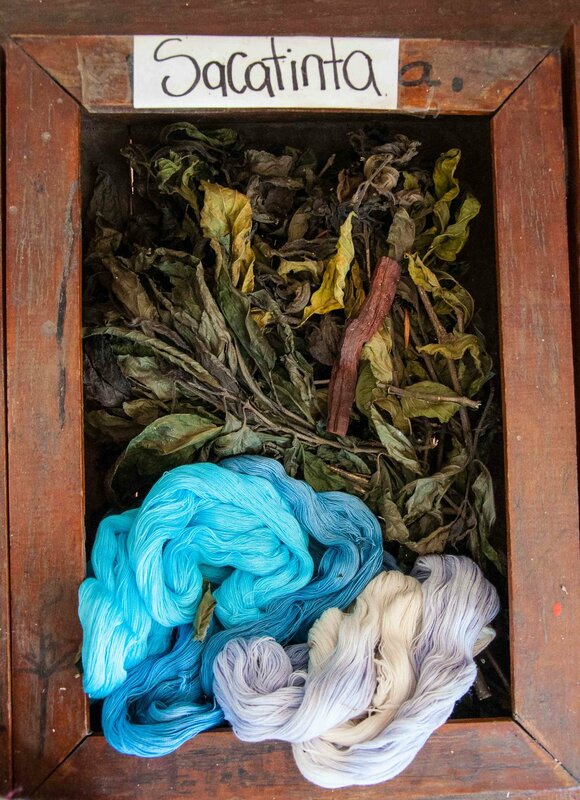 The dyes are made from different plants and trees from the lake area (see photos below) and each plant creates a beautiful, natural and unique color. 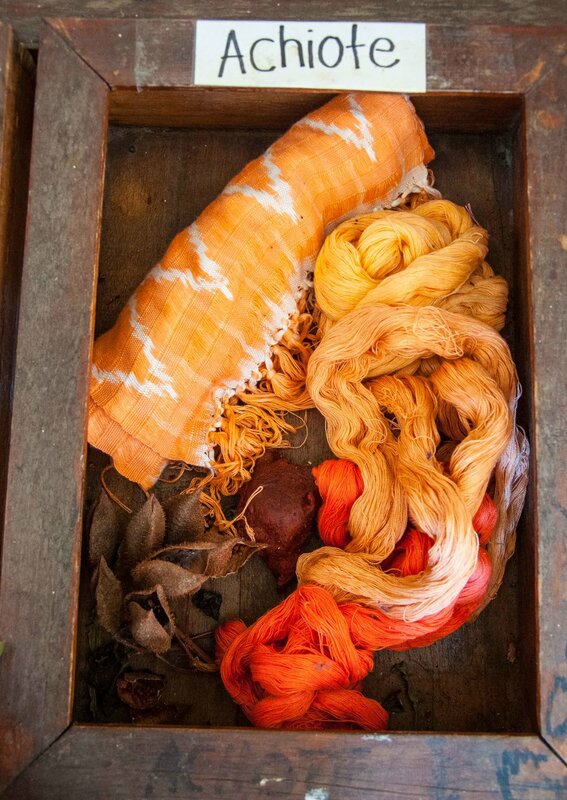 Once dyed and treated for preservation the natural threads are woven to create beautiful products such as our cosmetic bags and stunning kitchen and hand towels. The colors may vary slightly due to seasonal variations in the plants used for dying but that said if you select more than one of an item of the same color we guarantee that those items will match. The resulting products are all color set and will not bleed or fade. upcycled: materials that were previously used for one purpose and are now being used for a new purpose. 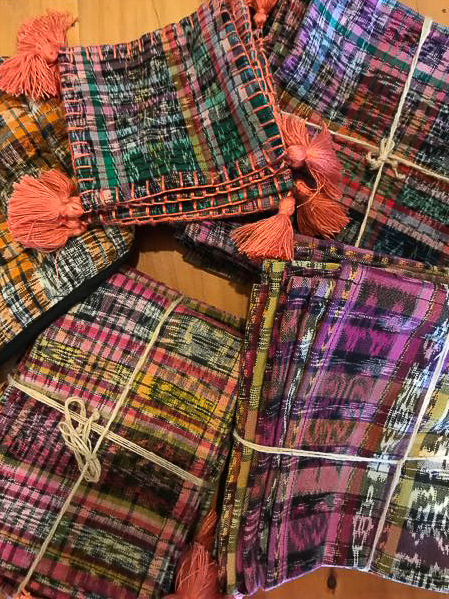 Many of ixöq's kitchen items and bags are made from upcycled jaspe ("haspeh") material which was previously worn as skirts by women from local communities. These materials are donated, or purchased by our partner organizations at a fair price that helps the seller support herself and her family. jaspe ("haspeh"): a traditional textile that is woven on a peddle-loom. The fabric includes intricate patterns of different colors centered around one primary color and design. hand woven: these products are woven by hand using a back-strap or peddle loom. We are trying to figure out the whole shipping thing but for now the formula that seems to work is a flat $4.00 fee plus $1.50 for each additional item. Usually this charges slightly less than we end up paying. ixöq ships through USPS or UPS for all U.S. orders. If you live in the DMV area and can come to Takoma Park, MD to pick up your order please select the 'pickup' shipping option and you will not be charged a shipping fee. At this point we do not ship internationally. Please note that the large cesta bags are costly to ship so there is a $10 surcharge on each bag ordered. We do not charge sales tax on orders placed outside of Maryland. Orders shipped to Maryland addresses will be charged 6% sales tax. As a general rule, we ship orders within 3-4 business days. We hope that you are happy with your purchase but understand that sometimes things don't work out. Please email us at info@ixoqus.com if you'd like to make a return or exchange. We honor exchange or refund requests received within 30 days of purchase. Exchanges will be processed within 3-5 days of receipt of returned items. Refunds will be processed within 14 days of receipt of returned items. You are responsible for the cost of shipping the product back to us but we will cover the cost of shipping the new item bought in exchange.